The Dutch National Police issued its officers and staff with 63,000 smartphones. The move opened up opportunities to complete tasks more quickly, but also to do things differently. Commissaris van politie and Mobile Programme Manager Edwin Delwel says mobile technology can be a game-changer for policing, if implemented well. The Dutch National Police have issued 63,000 smartphones to its officers and staff. Used in operational policing they help officers better establish identity and related information, and can be used for many basic operational policing tasks. The goal is to have the smartphone function as the primary workspace for most standardised police processes by 2020. To do this, the Dutch Police decided to develop a special app that will support this. This app (MEOS) is now the primary digital tool Dutch police officers use. The use of smartphones in everyday life has caused changes that greatly influence what we do and how we do it. Mobile technology has made our lives different by speeding up the things we do, and by making it possible to do them independently of location or time. Primarily, however, this technology has given us the possibility to now do completely new things, to radically change the way we organise our lives. 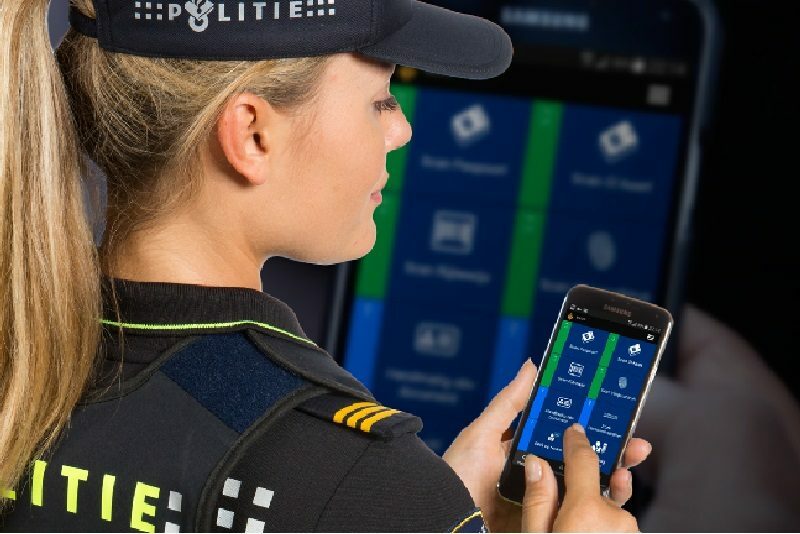 We see the same impact on policing: at the basis of the Dutch National Police decision to adopt mobile solutions on a large scale lies the realisation that this is game changing technology. Again, not just because we will be able to do the “old things” faster and more efficiently, but because we will be able to do completely new things. Not to embrace these opportunities is not an option, if only because officers will “en masse” adopt their own solutions on their private smartphones. Not to embrace these opportunities is not an option, if only because officers will “en masse” adopt their own solutions on their private smartphones, using commercial solutions like Whatsapp and Dropbox to provide for the tools their organisation does not give them. Leaving the organisation no longer in charge of its own data, creating other, completely new risks. And there are other, even more important reasons. On a national level within the Dutch police it was felt that a clear and unambiguous strategy on the development of a mobile infrastructure for policing was essential. Lengthy discussions were unnecessary: from the beginning it was obvious to force management/CIO that this was the road to go. The “business case” was a very simple one, as it was also obvious that there were major benefits to be gained in terms of effectiveness, efficiency and officer safety. Force strategy is that the primary workspace of the Dutch police officer will be a mobile work space, and fixed work space solutions will only be available for tasks that have proven to be unsuitable for mobile devices. This vision supported by CIO instigated decisions to allocate substantial resources forms the basis of what was done. Already in 2011, a strategy was formulated that would allow for the development of a generic mobile environment for policing. With a focus, at first, on designing and building tools to help officers rapidly identify and qualify (in terms of relevant criminal or other records) a person, the app has now grown into a tool that supports most standardised police processes. This coming of age has not been a trouble free process. It involved trial and error, success and failure. We learned a lot about what works and what doesn’t work for our situation, and our situation is in some ways different from others. There is however a red line that can be shared. The use of the smart device as the primary access to information and follow up work, combined with a generic, consistent interface across all processes is a deciding factor in achieving a much higher level of quality. Mobile technology allows for the introduction of extensive quality-enhancing measures in operational policing. This is perhaps one of the major opportunities mobile technology brings. There should be a constant check on the validity or completeness of the input, on legality of actions taken etc., not just by simple validation of input against verified back office data etc. Context relevant best practices can be suggested by the device, elaborate decision making can be built in. In my view the standardisation and optimisation of best practices and procedures is one of the major benefits of mobile policing which has until now been extremely difficult to achieve at the operational level. It is also a major factor in combating data quality problems, as careful design of the user-device interaction right at the start of the process has the potential to largely remedy the problem. For this reason, the Dutch police started its mobile journey focusing on thorough ID checks as an important first step in any process. This was achieved dedicated mobile functionality by using the device as a ID document scanner to prevent data entering errors, by always verifying scanned data from ID documents in background systems and automatically inserting verified data from these systems (as much as possible) in processes. The results show much higher process quality and a reduced need for costly error-correcting measures at later stages in the chain. Tablets are relatively clumsy, require two hands and experience shows officers tend not to always carry them with them. On the other hand, officers never leave their smartphone behind. Mobile devices offer huge opportunities to standardise quality of work. We find that the use of the smart device as the primary access to information and follow up work, combined with a generic, consistent interface across all processes is a deciding factor in achieving a much higher level of quality. And when done right, to a high degree of user satisfaction. Many current policing procedures were developed at a time when paper and pen were used to organise work. This now often leads to an approach to mobile policing in which the forms of yesterday simply digitized. In other words, it is paper put behind glass, preferably on tablets as their size is more recognisable and familiar. This works, of course, but we think we should do better. Mobile technology gives you a unique opportunity to completely redesign and optimise your processes. In doing this, you will of course find that this greatly affects all connected processes, workflows, protocols, support structures etc. Optimal use of the opportunities that present themselves will require changes made to most of these. Not only in your organisation, but also in all organisations that you interact with or that depend on you. This will increase complexity of realisation, but also increases the benefits of change hugely. The focus on tablets for front line policing should be reconsidered: tablets are relatively clumsy, require two hands and experience shows officers tend not to always carry them with them. On the other hand, officers never leave their smartphone behind: the result of constant availability of a device is much better process coverage, smarter solutions, and higher quality of input. Give officers a tablet and they will STILL want a smartphone. And a big one to watch out for: tablet screen sizes invite converting current forms to digital, whereas designing for a smart phone requires clever process redesign and intelligent interaction solutions. Making mobile solutions for policing is not primarily about buying devices and building apps. It’s about behaviour, about how police officers work more effectively and efficiently about the way their best practices in work should define the tools they use and not the other way around. Building a mobile workspace is an ongoing iterative activity in which there is constant interaction between experienced officers and designers/programmers. Therefore, it follows that an app is never finished: it is always a work in progress. Designing and building adequate solutions requires a lot of hands on knowledge of policing, and it requires constant attention to how this knowledge is translated into device-user interaction. The keyword here is “streetsmart”. We found trying to define this in exhaustive sets of specs at the start of a programme next to impossible. Experience in the Dutch Police has consistently shown the importance of joint involvement of operational users in the project team, working with technical staff. Experienced police officers should take the lead as product owners when designing, building and testing their own tools. Security is not what prevents mobile solutions, it is what makes mobile solutions possible in the first place. There is no absolute security, nor should you strive for it. There is only acceptable security. A compromise is always necessary between what is required in functionality and what is acceptable in terms of risks. That is never a technical decision: it is a business responsibility to weigh benefits and risks and decide on acceptability of security risks. Furthermore, user behaviour appears clearly to be the deciding factor as the effects of conscious and unconscious choices in everyday police use show. In the end a system that combines technology and behaviour-focused methods to achieve the best possible compromise is called for, together with the strategic decision to accept the cost-benefit assessment that comes with it. Implementing mobile solutions in policing on a large scale is a major undertaking. As described, it involves an integral change process on most aspects of the organisation and as such strategic level priority is called for. It is NOT an IT project: it is an undertaking of profound organisational change (with an important IT component). Put the business in charge, IT in the supplier role. We think it is crucial to have a senior police officer in charge who has the right skills and experience in major operational change supported by a strong strategic mandate. This, together with real engagement of operational officers who have meaningful influence over the design, is the way to ensure that the end-product is seen by operational users as really being fit for purpose. In policing, the accepted use of mobile technology has until recently been to access legacy police systems and to obtain information. Type something, wait, get an answer. That is changing. Designing and building, testing and implementing mobile solutions requires optimal flexibility as it will be next to impossible to define definite specs. Technology is changing constantly. Policing changes constantly as do the circumstances under which it needs to be done. The operational life of solutions is relatively short. This calls for small, frequent steps, with the full participation of users and constant operational testing of new functionality, however small. It requires agility, flexibility, taking risks while at the same time minimising them. Small steps mean small risks. The focus should not be on the perfect plan, but on the perfect team and the strategic backing it gets. Our experience shows the importance of an evolutionary approach to successful mobile programmes: agile development and frequent prototyping and confirmation of designs with front-line users. Our experience also shows the importance of accepting this at strategic level. In policing, the accepted use of mobile technology has until recently been to access legacy police systems and to obtain information. Type something, wait, get an answer. First, because the number of sources of highly relevant information is rapidly increasing. Social media, multimedia, Internet of Things, trackers and tracers, inter officer chat – a number of new sources are now (becoming) available to officers, without the direct need for back office intervention. Mobile devices “know”. Second, because the old “pull” concept of typing in a question and waiting for an answer from a background system is disappearing. Smartphones have sensors, they know who you are, what your skills are, your preferences, your tasks, whether you are walking, running or driving, they know where you are and what is relevant there. They can recognise faces, voices and fingerprints. Mobile devices “see, hear and feel”. Third, because a practical useful form of machine intelligence, artificial intelligence is now becoming available on mobile devices. Devices are able to combine and enhance all that data into context relevant information and provide you with it at the right time, or the right location, in the right circumstances. Without being asked for it. Mobile devices start to “think for themselves”. We are rapidly going towards a situation in which there will be a symbiotic relationship between a user (police officer) and his or her wearable devices, in which the device acts on sensor data to constantly provide the officer with relevant, made to measure information from the sources mentioned above, and many others yet to come. Scan a driver’s licence and within three to five seconds your phone will vibrate if you need to act fast. It helps. Three years along the road we took, we see an increase in officer safety, real and perceived, as a result of relevant, more reliable and more up to date information being available. Scan a driver’s licence and within three to five seconds your phone will vibrate if you need to act fast. It helps. We also see a high level of officer satisfaction among active users, as a result of being able to spot “irregularities” much better and much faster. You solve cases that you did not even know were there. Officers are better informed. On their smartphones, they now have permanently updated info on hot spots, interesting people, incidents, things that are relevant within their team, or region or nationally. We see improved quality in administrative processes. We see a decrease in the need for structural and costly repair at later stages in the chain. There is a definite “first time right” effect. We see a decrease in the need for elaborate back office support. We see that things are being done faster, better and safer, and that new things are being done. And we are sure this is just the beginning.